During the 79th Regular Session (2005) of the Texas Legislature, House Concurrent Resolution 36 was approved giving legislative authorization to a Texas Vietnam Veterans Monument on the state Capitol grounds. The monument is a testament to the honor, courage, sacrifice, and call to duty of Texans that served in Vietnam. It also serves to honor those 3,415 Texans that made the ultimate sacrifice in battle. The monument, created by artist/sculptor Duke Sundt, is to be cast in bronze and rest on a pediment of concrete and Texas Red Sunset granite. 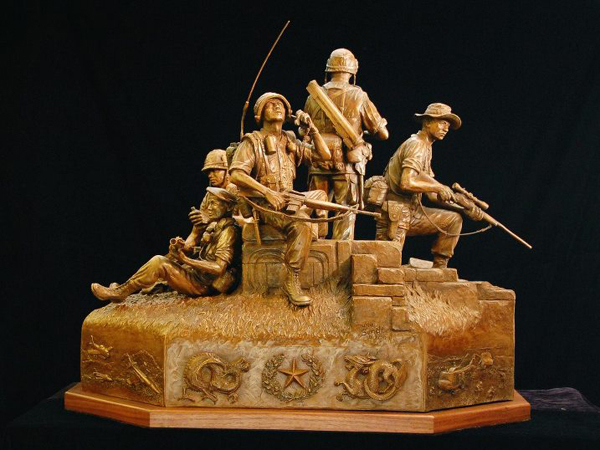 It consists of five figures each 1.25 times life size representing the diversity of Texans that served: The Grunt – an Anglo-American; The Raidioman – a Native American; The Scout Sniper – a Hispanic American; The Medic – a Black American; The Wounded Soldier – an Asian-American.